On my recent trip to Georgia, I got to hang out with some friends as I noted below. During my time there I got to see (and borrow!) The Imperial Armor Masterclass book from Forge World. First off, this book is awesome. Totally awesome! Its is a must read for anyone painting tanks, particularly Imperial Guard tanks. Additionally it reviews techniques that I have been exploring with oil based paints, other thinners, and weathering pigments. Thankfully, I was able to barrow the book- but now I think I'll need to purchase my one copy. Its that good. 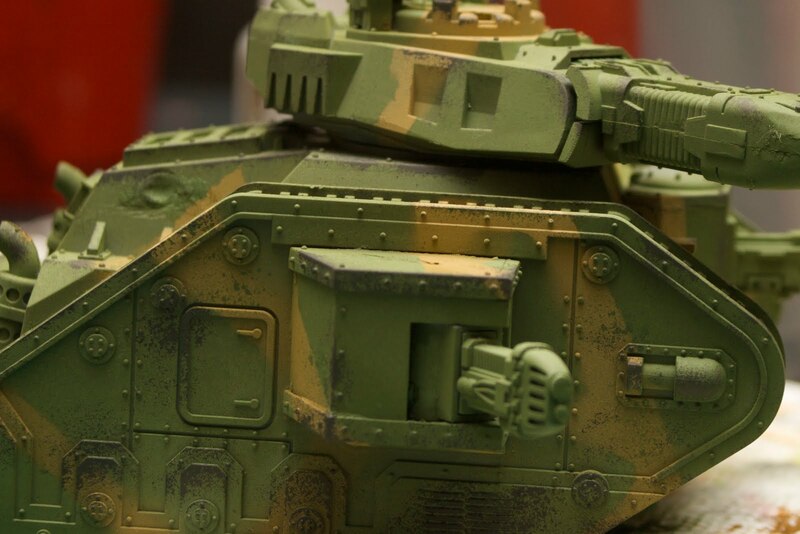 First thing was assembling the Executioner and adding some battle damage to the tank. One of the techniques discussed was to take a Dremel Tool and sand down an area to represent shell implosion on the hull. Once you have your 'divot', fill it with green stuff. 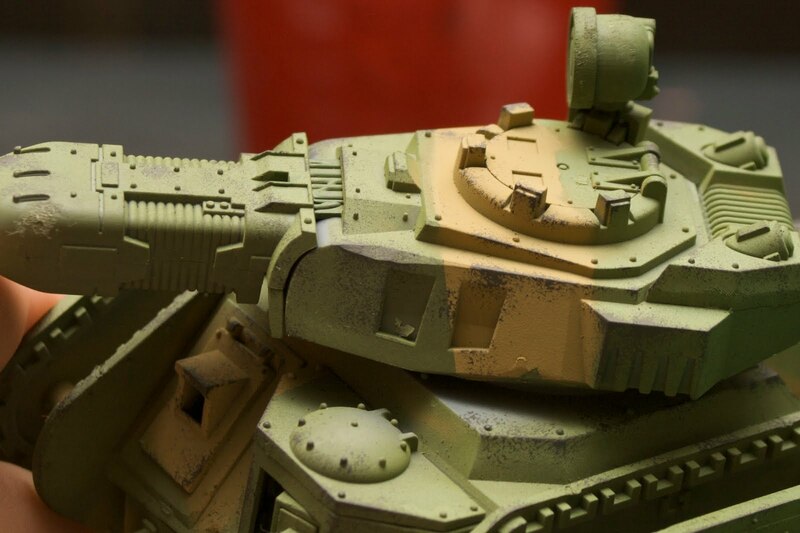 Then you can shape the green stuff to represent the metal of the tank bending against the force of the shell. Four or five of these areas were added to my LR:D to give a nice battle scarred look. The book uses air brushes a good bit. The one thing I know about air brushes is that you need a nice kit (i.e. spend ~$500 and thanks to my good friends at the IRS several good kits went to keeping my roads paved and the military in foreign affairs) and 6 months of time to use the gear. Having neither, I used spray paints- Army Builder Army Green and Desert Yellow. My new can of Army Green was noticeably lighter than my older can as well as the Desert Yellow. While I have been a big fan of these products over time, they are having some consistency problems with the pigment. I am now considering using a single stage air brush and starting to learn how to use the gear. 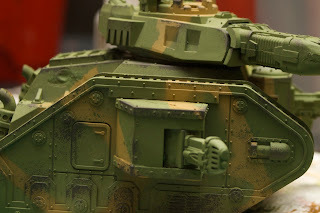 Anyway, Army Green was used followed by placing low-tack "painters" tape on the model leaving areas exposed for the camo pattern produced by a few quick sprays of Desert Yellow. I then grabbed a sponge from a blister back and added Foundation Paint Charadon Granite and applied it randomly to the tank to represent paint peeling- thus starting the weathering procedures. 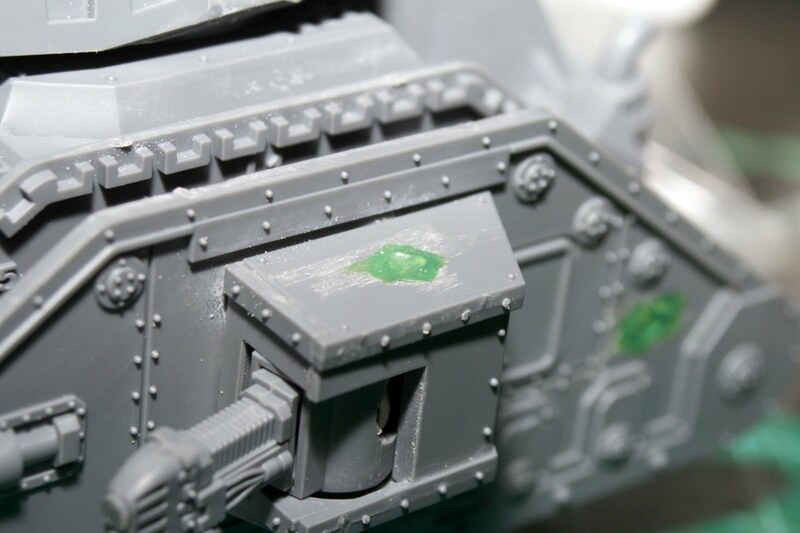 Be sure to focus on areas that will suffer weathering/paint peeling the most- around the edges, near crew access points, around moving turret parts, etc. Next time I'll break out the oil paints and really start to distress the model! Looking good, man. That's interesting about the inconsistency you've noticed from the Army Painter stuff. I wonder how common that problem is for other people. Good luck if you get up the courage to start messing around with the airbrush. I think I'm going to try out the Citadel spray gun pretty soon on some terrain I've been assembling. I had some trouble making out the shell impacts against your tank once the paint was applied. Is it a fairly subtle effect in person? I heard that a few people had complained to Army Painter about the consistancy of their primers. Apparently they are using a new formula. However, after a couple of days of debate, I decided to go back and paint over the primed sections with the colors I wanted. The resulting colors are a much better match with the rest of the army- so I am happy. The only problem is that the detail was destroyed, so I'll have to redo that step(s), but nothing too horrible. I didn't get any good shots of the shell impacts in those pictures- once the paint is on, I hope you can see it better.